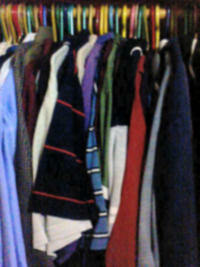 There are some clothes which have been left in my closet unworn for over a year. These clothes simply didn't fit me anymore. I used to put them in a box and labelled the box "someday magkakasya" (someday it would fit). The last box I placed clothes in ended up being donated to charity since it's been kept in the box for over 3 years and became either fashionably passe or the cloth simply got worn out over the years. Currently, I'm happy to have discovered that the 1-year old clothes that I stopped wearing cause they didn't fit anymore suddenly now fit and some are even a bit loose ! I was surprised that they fit me again. And so now, I feel that instantly, I have new wardrobe to mix and match.